With the sheer number of air compressor models out there, finding the most suitable and best value for money one can be a daunting task. What to buy if you have to use it on a daily basis? What to look for if you only use it once in a blue moon for inflation or handle a ball? People usually look at specs like horsepower, pressure, or warranty and overlook this no less important factor when picking an air compressor: how much noise the compressor generates when it operates. I know many of you are planning to use an air compressor in a garage where noise can disturb the whole family or even the neighbors. This is why I made this list of quietest air compressor for garage to help you land the air compressor that fulfills the tasks and at the same time; don’t cause you too much trouble with the sound it generates. This list is in order of size and power. 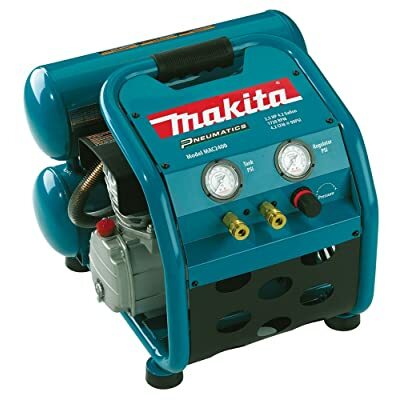 If you are looking for a super powerful air compressor to handle heavy-duty tasks such as trimming metal or sanding old steel panel, without a long recharge time, you may want to scroll to the bottom of the list. Otherwise, feel free to go through the products on top and cherry-pick the one that suits your needs. The Makita MAC2400 packs serious power with the 2.5hp 4-pole motor. It’s able to deliver compressed air at a rate of 4.2 CFM at 90 PSI, which makes it compatible with a wide range of jobs. Another thing I appreciate about this air compressor is the twin-stacked 4.2-gallon tanks. It supports stability so I don’t have to worry about placing it on uneven terrain. The Makita MAC2400’s pump is oil-lubricated, which allows cooler operation and durability. It also makes this a surprisingly quiet compressor since the pump runs at just 1730 rpm, emitting 79dB of noise. The fact that this compressor is built of cast iron can assure its sturdiness. The Makita MAC2400 is able to handle some heavy duty tasks that require power and fast recharge. It features Big Bore cylinders and pistons that are proved to compress more air so you will have a constant flow of pressure and a quick recovery time. They are also made out of cast iron for durability and longer lifespan. As with most compressors of this range, the Makita MAC2400 has a low amp draw, which translates into two advantages. First, it has a higher resistance against certain drops in voltage; and second, you don’t have to worry about tripped breakers at start-up. This model has an air filter, similar to those you find on a car, resulting in cleaner air and better intake. While quiet is a relative term when it comes to an air compressor, I am confident to claim that the Makita MAC2400 emits less sound than any other competitor. However, let me remind you that no air compressor can be flat-out quiet, you can still hear it running but the sound will not bother others in the same building or makes you unable to hold a conversation while standing next to it. The rubber feet of the MAC2400 make sure that its vibration is reduced, which in turn helps to keep noise at a low level. With all the benefits squeezed into just one product, the Makita MAC2400 comes with a higher price than another air compressor on this list. Also, it can only handle some common tasks such as powering paint spray guns, airbrushes, or inflating tires. However, if you decide on purchasing it, you will find that it is worth every penny. Overall, the Makita MAC2400 is suitable for a wide range of tasks, but the price can deter those without a deep pocket. The CAT 8010 features a 1.0HP motor at 1680 RPM, not the model you can rely on for great power to handle heavy duty tasks, but it has enough to fulfill simpler jobs such as inflating, powering air drill, air chisel, and brad nailer. If you don’t engage in anything requires too much power and prefer a compressor that makes a less loud sound, this one fits the bill. With the noise level of just 60 decibels, it can work in a garage or workshop without disturbing anyone. The CAT 8010 comes with an oil-free dual piston pump system that can guarantee its performance in various temperature and terrain. This air compressor also boasts a life cycle of 3000 plus hours before wear, in comparison with 500 plus hours of other models. If weight is an important criterion for you, the CAT 8010 is a good candidate for the next purchase. It is roughly 54 pounds with an 8-gallon tank. A wheel kit is there with the main unit to facilitate mobility. In a model with so many good features, the valve stands out for being quite a disappointment. It is made out of poor material. While I can trust other components to last for a long time, I cannot claim the same thing for the valve. This one is at the perfect price range and power level for common tasks around the garage like powering a lawn tractor or operating a drill. For its humble size and compact design, the California Air Tools 10020C packs some real muscles. It gives 2.0 CFM at 90 PSI and 3.0 CFM at 40 PSI. This level of power is suitable for most small hand tools or airbrushing. However, as the tank capacity is limited, it can only maintain peak performance for a short period of time. 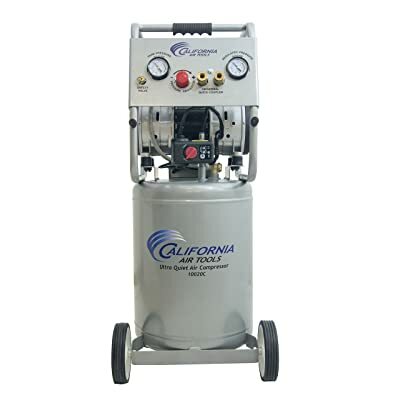 For an air compressor of this size, the California Air Tools 10020C can exceed your expectation. It is adequate for home use, automotive and workshops. The cycle provided can sustain for around an hour or more at 2.0 CFM. These are not so superior in comparison with some other models on this list, but it is rather impressive for its size range. Landing this air compressor and you will be spared of maintenance effort. Of course, you have to pay some attention to it and keep it free from dust and debris, but your responsibility ends there, clean it regularly and you will be fine. This is by far one of the quietest air compressors on this list. I must say that there are not many brands can do better than CAT in terms of keeping noise at a low level. However, the one thing that I don’t like about this air compressor is the manifold feed line. The tubing is only 1/4” so if you want a high-flow output, you need to plump it in by yourself. The California Air Tools 10020C can be both professionals and occasional users’ best friend. It can handle simple tasks like inflation with an ease and more complicated and arduous ones. If you need an air compressor that is compact, light weighted and durable, this is the one for you. 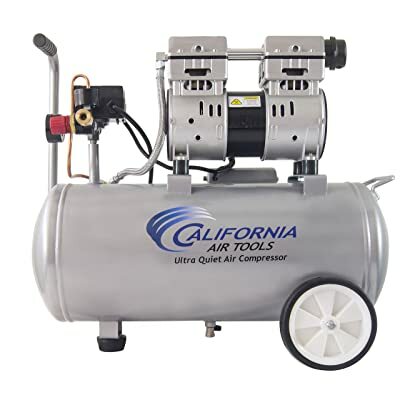 If you are unable to stretch your pocket to purchase a full-size air compressor to paint cars, this model is a nice substitute with a lower price. It is also smaller and more compact, making it easier for you to bring it from one side of the car to the other. However, it is not without drawbacks. This compressor delivers 6.2 CFM at 40 PSI, which means you can only attach a low-volume spray gun to it. Also, the 20-gallon tank makes it slower to get the job done in one pass than with other models. But if you are a budget-conscious user with a limited workspace, this one fits the bill nicely. Another thing I like about this model, besides its reasonable price, is that it dissipates heat quickly, which means you can work with it for a long hour without damaging its delicate components. So the overall wear and tear will be reduced. In short, this Industrial Air IL1682066.MN is ideal for those who don’t want to splurge on air compressor but still want a decent model for car-painting. This Industrial Air ILA1883054 is one of the best air compressors I have ever laid my hands on. 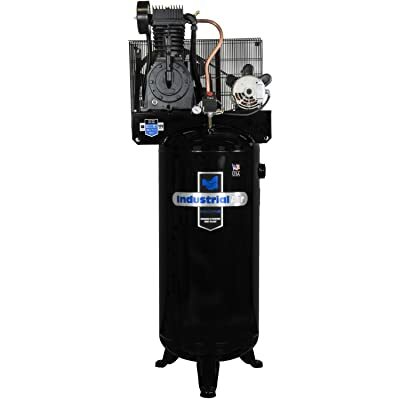 In fact, it is one of the best-selling and top-rated 30-gallon air compressors on the market. I was impressed with how quiet it operates and how user-friendly it is. One drawback I notice in this model is the time it takes to recharge. 8 minutes to fill up to reach 155 PSI is a bit longer for my standard but 2 minutes to recharge from 90 PSI back to 155 PSI is a nice compensation. Plus, the tank can hold pressure for 24 hours without a slip. At only 78dA, this air compressor makes less noise than a typical air compressor of the same 30 gallons tank size. It’s also highly versatile, with a 120-volt outlet but can be converted to the 240-volt application. Good news for anyone who is using 220 volts. However, the motor best runs on 120 volts. The Industrial Air ILA1883054 is a good deal for noise-sensitive users. Also, it is solidly constructed. The price might be a problem but the quality is definitely worth the money you have to spend to get it. This one is a real workhorse for professionals. The 5 HP motor is able to handle some heavy duty tasks. I love the fact that it takes only 90 seconds for the receiver to refill from empty. The measly noise is another plus. With the slow pump r/m (720 r/m); this one is a true quiet beast. I can still hold a conversation while standing next to it without any hearing problem. 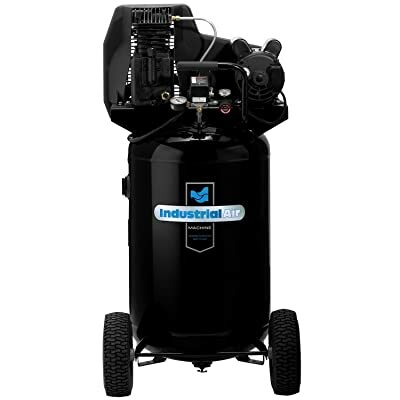 The Industrial Air IV5076055 is a well-designed air compressor. The components are of great quality so you can expect it to last longer than some other models. But this advantage comes hand in hand with its biggest drawback. 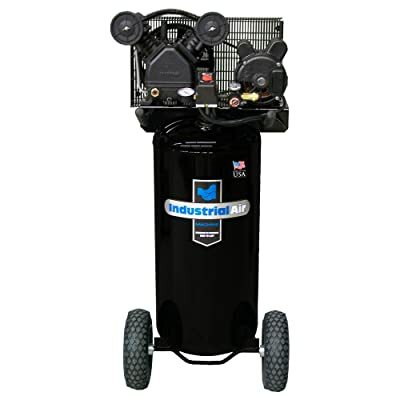 This air compressor is heavier than other models on this list, which might come at a problem if you have to move it from place to place often. This one is the best choice for professionals who require an air compressor that allows multiple users, can handle heavy-duty tasks and last for a longer time without recharging. Of course, these many benefits come with a higher price, but it’s worthwhile considering how durable this one is. I know many of you will be inclined to land the quietest one on this list to save you as much trouble as possible. However, it’s worth balancing its features with how much noise it makes. In other words, finding the middle ground between quietness and function.